So in a move that reminds me of the original Micro Four Thirds initiative (moving to a less crowded playing field), the NX mini moves away from the APS-C sensors in the NX line to a 1″ sensor size, like that of the Nikon 1 series. The potential difference here is that Samsung does have experience in crafting a consumer experience that casual users might like that is also connected. 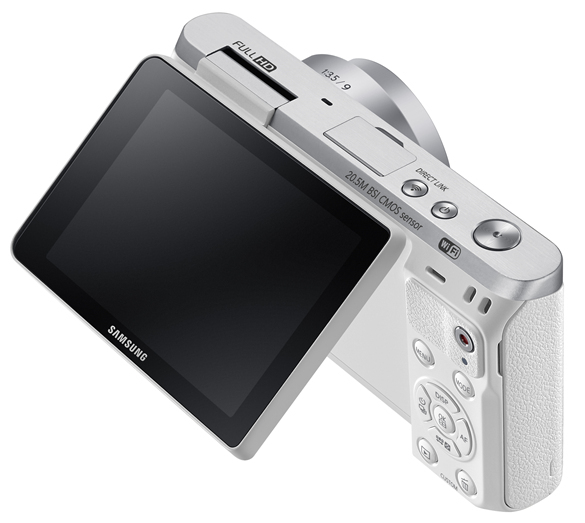 If you have tried using a recent Samsung camera like the NX 2000 you might have an idea of what I am saying. It is a nicely done camera that is very smartphone-like, runs a decent OS (Tizen), and has a lot of fun little things that many will like. Of course if it sinks under the anonymity of the usual NX no-shows in the digital camera landscape, its not going to sell well, is it? CK: Given the lacklustre success of Samsung cameras compared to their highly popular Galaxy line of mobile products and TVs, I am not sure how well this will sell. As YS mentioned earlier, Samsung have all the chops to properly market this better. I wonder if Samsung will make an adaptor like the Nikon FT-1 to mount their existing NX lenses onto this and gain a 2.7x crop for super tele shots. That’d be an interesting and fun addition, though probably not for the demographic that this line is targeted to. YS: As for the camera itself, it is a fairly small and very thin camera at 22.5mm in thickness, packed with a 20 megapixel 1″ sensor, a somewhat lacklustre HVGA 3″ LCD that does the 180 degree thing for selfies and is touch-enabled, 1080p video at 30 FPS (and only 30 FPS), WiFi with NFC, and of course, the new NX-M lens mount. In the usual move to make the camera smaller, the NX Mini follows the Nikon V3 in using microSD cards. I am sure that will actually go down well with the customers Samsung is pitching this to. No, I was not being sarcastic on that one. As for the lenses, there is a 9mm (24mm equivalent) pancake prime that is a bit slow at f/3.5, a 9-27mm f/3.5-5.6 (24-72mm equivalent) collapsible kit zoom which could be made a little thinner, and the 17mm f/1.8 (45mm equivalent) fast prime. The latter two lenses will have image stabilisation. CK: I think for their target market, f/3.5 is quite fine. Remember that kit lenses are usually f/3.5-5.6 or slower anyway. As a start, I think that’s a rather decent set of lenses. Also, starting off with 24mm equivalent is a nice touch, compared to the 28mm equivalent that most kits come with. The NX mini will be available in April for US$450 with the 9mm, or US$550 with the 9-27mm. The pricing is far more sane than it was for the Nikon 1, but can Samsung finally pull it off? This entry was posted in Photography and Gear News and tagged 17mm, 9-27mm, 9mm, NX, nx mini, nx-m mount, Samsung by Yuan Sheng. Bookmark the permalink.